For his new installation at Lehmann Maupin, Do Ho Suh uses rapid prototyping and handmade miniatures to rebuild two of his former homes. To get to this level of detail, Suh, who has created 16-foot-wide parachutes and staircases made of nylon that fill whole museum rooms, used measurements that he took while living in the building as a student and then also went back to take additional dimensions that he needed to complete the model. Three of the rooms were constructed from memory and the others were imagined, based on research into typical college homes in Rhode Island. The installation also includes a miniature version of his childhood Korean home that crashes into the Providence apartment like it was tossed by a Kansas tornado. 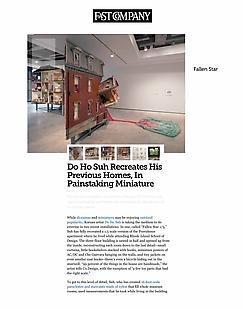 But the Wizard of Oz comparisons are more apt for the second installation, entitled “Home Within Home,” where Suh has created a model of both homes out of translucent blue resin using rapid prototyping. In this version, the artist’s Korean home is housed inside the Providence building, instead of crashing into it. This model is divided into four equal sections and glows like an architectural plan for the Emerald City. “Fallen Star 1/5” and “Home Within Home” are on view at Lehmann Maupin Gallery in New York City until October 22.